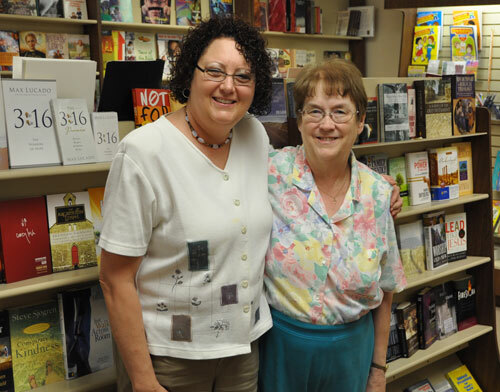 Jane Seely (left) and Marilyn Waters in the bookstore. Marilyn has spent a lot of time with Jane during May, helping her understand the many aspects of running the bookstore operation. To help say good-bye and show appreciation, the staff took Marilyn out to lunch on May 10. 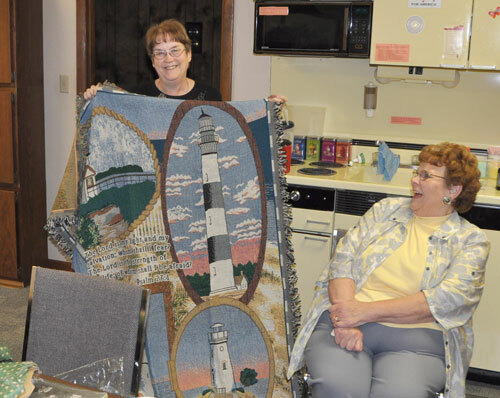 Then, on May 24, she opened several presents with a lighthouse motif, including this afghan (Marilyn collects lighthouses). On the right is Mabel Mundy, who works in accounting. 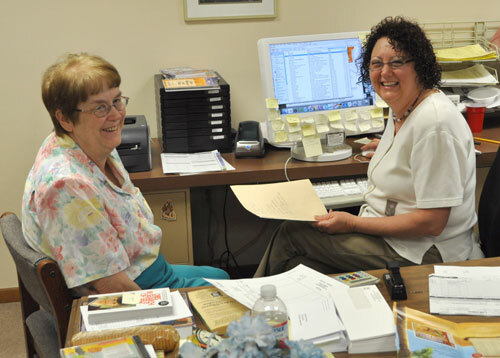 Since 1996, Marilyn Waters has been in charge of the Healthy Ministry Resources bookstore. She has diligently handled all curriculum orders from United Brethren churches, shipping out thousands of pieces of Sunday school literature and other materials every quarter. But now, after 15 years, Marilyn has decided to retire. She let us know a couple months ago. Today, May 26, is her last day in the office. Marilyn was hired in 1996 to manage the United Brethren bookstore following the departure of Euanna Holloway, who had held that position for many years. In addition to supplying Sunday school curriculum to 150 UB churches, she also handled curriculum sales for 180 other congregations. We are also the official distributor for the Missionary Church USA. Marilyn and her husband, Ted, a former high school teacher, live in Bluffton, Ind., and are members of Park United Brethren church. They have two children, Scott and Sheri. Replacing Marilyn will be Jane Seely. Jane has worked alongside Marilyn since January 2009. She is the person who actually boxes up and ships Sunday school orders. So she knows how things work. Jane will work Monday through Thursday with the Healthy Ministry Resources bookstore. She is also a beautician, which is how she plans to spend her Fridays. Jane is a former United Brethren pastor’s wife, and is the sister of Rev. Mike Caley, pastor of Banner of Christ UB church in Byron Center, Mich. Jane and her husband, Rod, live in Huntington, Ind. They have three children: Michael, David, and Rachel. Robert Shellhouse, a retired UB pastor living in Hart Mich., underwent an abdominal aortic aneurysm surgery on Tuesday, May 24, 2011. He is expected to come home today, May 26. Please continue to pray for a speedy recovery. Mongul Church is looking to hire a worship leader for a contemporary worship experience. This opportunity is part-time. As the church grows, it may become fulltime. Mongul Church is located in Shippensburg, Pa. We are a growing church of 195 people. Mongul offers a traditional and contemporary service. Mongul Church is striving to be a church that Loves God, Loves People, and Serves People. Is skilled in guitar (acoustic and/or electric). Is familiar with Macs and ProPresenter. In 2012, Huntington University will become the first Christian college in Indiana to offer bowling as a varsity sport. Only three other Christian colleges compete in bowling–in Missiouri, Kentucky, and Georgia. The university will launch a men’s team and a women’s team, with 12 athletes per team. The season will run October through April, with multiple weekend tournaments. In 2010, bowling became an emerging sport in the National Association of Intercollegiate Athletics (NAIA) as a result of 25 member institutions declaring participation for that academic year. Fifty varsity programs are needed to become an NAIA championship sport. Last year alone, more than 300 boys and girls bowling teams competed in Indiana, and many local high schools host teams. The Huntington University Foresters currently compete in 14 intercollegiate sports for men and women. Dolly Munn, 90, passed away on Friday, May 20, in Bowling Green, Ohio. She and her husband, Howard Munn, who survives, were married in 1941. They pastored several United Brethren churches in the former Sandusky Conference–Bethel UB (Elmore, Ohio), First UB (New Castle, Pa.), and 26 years at Mt. Zion UB (Wayne, Ohio). More recently, Howard served as Visitation Pastor at Mainstreet Church in Walbridge, Ohio. Rodney A. Minor, 57, a former minister in Pennsylvania, passed away May 17, 2011, at his home. Surviving are wife Mary and daughters Adrienne and Allison. Memorial services were held May 20 at at Lebanon AreaEvangelical Free Church in Jonestown, Pa.
Attendees of the 2011 UB Youth Summit in Holly Hill, Fla. (click to enlarge). The 2011 UB Youth Summit was held May 2-5 at First UB church in Holly Hill, Fla, (near Daytona Beach). This year, 23 youth workers from across UBdom gathered for a time of relaxation and refueling as we spent some much needed time “focusing” and “refocusing” on the things that are really important. Rev. Denny Miller, senior pastor of Emmanuel Community Church in Fort Wayne, Ind., was our keynote speaker. He shared with the group the importance of focusing on the Word of God. This proved to be a very valuable time as each of us were challenged in our preparation and our presentation of our messages and lessons. The Summit was a beneficial time of networking with other youth leaders and being encouraged by others who are in the trenches of youth ministry. We enjoyed the beach, the golf course, and the incredibly beautiful weather, along with the opportunity to slow down and step away from the constant demands of Youth Ministry. Mark your calendar for next year’s Summit: April 30 – May 3, 2012. It is well-worth it! 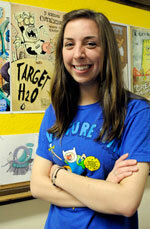 Sarah Krzynowek, a senior animation student at Huntington University, has been awarded the Student Illustrator Scholarship to attend a conference in Los Angeles in August hosted by the Society of Children’s Book Writers and Illustrators. The SCBWI is the world’s largest professional organization for children’s book illustrators and writers. Krzynowek, a native of New Hartford, Conn., was one of only three to receive this scholarship. The scholarship will provide admission to all conference events including keynotes and breakout sessions, entry in the Juried Portfolio Showcase, attendance to the illustration master class, an individual portfolio consultation with an illustrator or art director, and one year’s society membership dues. 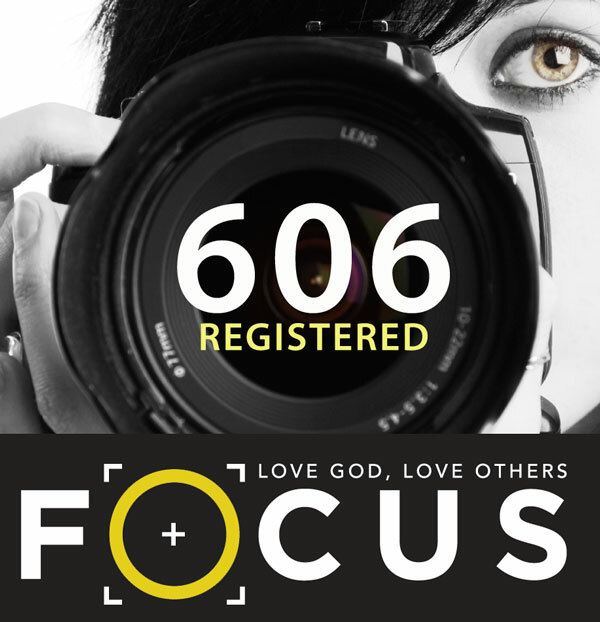 Registrations for this summer’s US National Conference hit 606 on May 19, up 60 from two weeks ago. You can register online, or by using the registration brochures mailed to all churches. 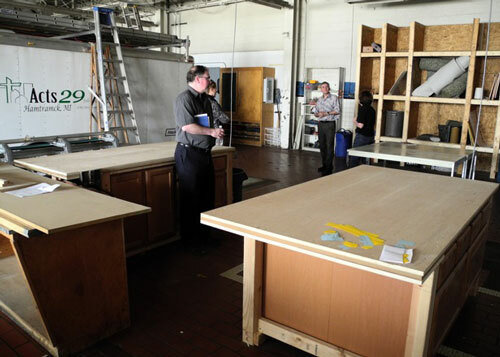 The cabinet-making shop at Acts 29. Recently, I was in the Detroit area looking for opportunities for UB people and churches who are interested in short-term volunteer work in the United States–specifically to unreached people groups in the US. Joining me were Paul Plato, the Missions Coordinator for the UB Church in Canada, and John and Chris Polegato, from the Grace UB church in Sherkston, Ontario. We visited two exciting locations near Detroit, Mich., where groups are working with urban and ethnic populations. Both are eager for volunteers this summer. Perhaps you or someone from your church would be interested. 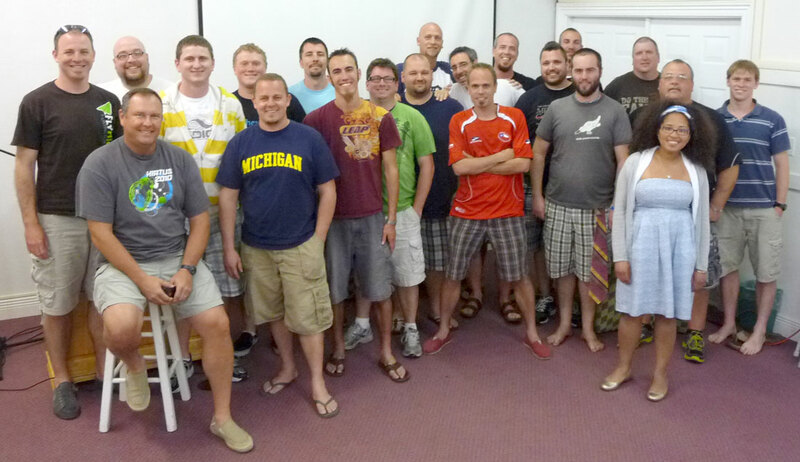 John and Chris Polegato, from the UB church in Sherkston, Ontario, plan to spend three weeks this summer with Acts 29. John is an ESL instructor for the Ontario government, and Chris is a Christian counselor. One is Acts 29, in Hamtramck, Mich.
Acts 29 is presently focusing on a four-square-mile area recognized as Detroit’s second empowerment community. This area includes two square miles of Detroit proper, and two square miles of the city of Hamtramck. This area is home to five major people groups: African American, Polish, Arab, Bosnian, and Asian Indians (from Bangladesh). The two square miles of Detroit is 80% African American. This empowerment community has some of the lowest rankings in the country in family structure, economics, education, employment development, and housing. The Christian faith is proclaimed by some, but not lived out in any way. More prevalent is the Islamic faith, which claims 60% of Hamtramck’s population. Cost per day for food and lodging is $41 per person. For more information contact Sharon Buttry, the Missions Coordinator, or visit their website.